All are invited to join us thisSunday at 9:30amfor ourRise and Shine Mass. 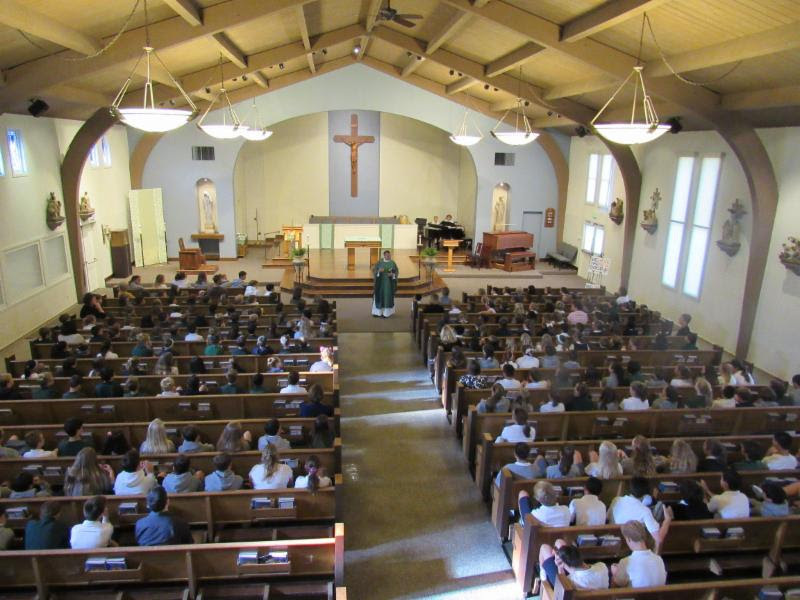 This joint celebration includes students and families from school and faith formation in the liturgy and this month our student leaders will assist as lectors and gift bearers. In response to the recent hurricanes,ourMission Effectiveness Committeeis partnering with the National Catholic Educational Association (NCEA) and their"Student To Student" program to help those affected by the recent hurricanes.Help us to help them by donating aminimum of $2 per student. Please bring in your donation to the office byMonday, September 25th.NCEA will distribute 100% of the funds to dioceses in the affected areas for the Catholic schools in vital need of support. There is still time to support our Golf tournament.You canplayin our fun 'best ball' tournament,volunteeras a helper, or join as asponsor.All proceeds support our technology needs throughout the school and your generosity and support is appreciated by the staff and students!Clickhereto register.Clickhereto sign up as a volunteer.Clickherefor sponsorship opportunities. Finally, all families are asked to support theSt. Perpetua Parish Oktoberfest. Our school is a ministry of St. Perpetua Parish and many costs are shared between us.Your participation as a volunteer for at least one shift is included as part of your tuition agreement and is vital in the success of this event.Our Junior High students are encouraged to participate as a volunteer.Clickherefor volunteer sign-up. Dust off your clubs...We need your support! Mark your calendar forMonday, September 18, 2017for a fun filled day of friendship, golf, good food & spirits flowing at the beautifulOrinda Country Club.Your participation in this 'Tee-Off Technology' Tournament, whether you play, sponsor a hole or are a Title sponsor, will make a difference for our kids and teachers. Additionally,raffle tickets can be purchased when you register to playbut will not go towards the contest above.Clickherefor registration link. Clickherefortournament registration link.If you would like to be a donor or sponsor, here is theSponsor/Donor Form. If you need childcare for tournament day,Panther House is available 3pm - 6pm.Just email Mrs. Kenneylkenney@csdo.orgto let her know you'd like to add your student(s) for that day. We also needVOLUNTEERSto help us on tournament day.It's a fun way to meet people, enjoy a beautiful day on the greens, get volunteer hours, and help our school.Afternoon shifts get DOUBLE volunteer hours!Hereis a sign-up link for volunteering. Help us to help them bydonating a minimum of $2 per student. Please bring in your donation to the office byMonday, September 25th. Please join usthis Fridayat theopening of Cafe` Perpetua!We are celebrating our 15th year anniversary, and we are so looking forward to seeing old friends and meeting new ones! It's a great place to reconnect with friends and for new families, and it's a wonderful gathering place to get acquainted with parents from our community.Cafe` is open 7:30 am - 10:00 am. The cafe` offers a full breakfast menu including homemade cinnamon rolls, coffee cakes, raspberry bars, seasonal scones, muffins and breads, croissant breakfast sandwiches, fritattas, yogurt parfaits, gluten-free items, specials of the day, along with coffee, lattes, hot chocolate and fresh squeezed oj. We also will be selling seasonal homemade items such as jams (blackberry, blueberry, red raspberry, strawberry, peach, and spiced pear), basil pesto, zucchini breads, and fresh eggs, amazing produce and flower arrangements all from the bounty from the Garden of Learning!All proceeds from the cafe` directly benefit your children's garden. We are very excited for this year's opening of Cafe` Perpetua, and are looking forward to seeing you then! Deborah Lee Rose, award-winning author of the new book, "Beauty and the Beak: How science, technology and a 3D-printed beak rescued a bald eagle", is coming to St. Perpetua School. If your child would like to pre-order her new book, please download theOrder Formand submit with payment to the office no later thanWednesday, September 20th. We have a limited number of her new book available and they will be issued first come, first serve. You can also purchase "The Twelve Days of Kindergarten" newly available in paperback to be autographed. She will be presenting another book, "Jimmy the Joey: The True Story of Amazing Koala Rescue"to students in grades TK-2. If you wish, you can purchase this book elsewhere and send a copy to school with your student for her to autograph. St. Perpetua's Summer Reading Program was BIG FUN with most of our students reading, during Summer Break. Popsicle Party: All summer readers in grades TK-3 and VIP BINGO readers in grades 4-8 are invited to our Popsicle Party. The party will take place nextTuesday, September 19thin the Amphitheater, during recess. Students just show up. Summer readers who qualify will find their name is on the VIP list and will get to select a popsicle. Thank you to Melissa Silvestri and Anne Hawkins for planning the party. Blackout BINGO Day:Thanks to all ourBIGReaders, the entire school gets to celebrate a Blackout BINGO! Day onSeptember 19th. That means black attire free dress for all. Thank you Summer Readers! 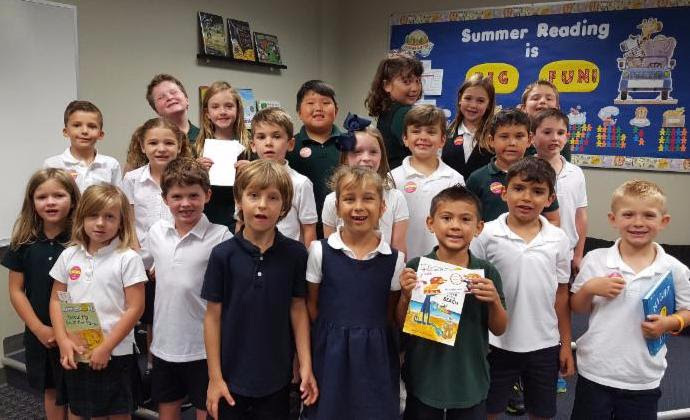 BIG Readers:A special congratulations goes out to the First and Second Grade classes with the most participation in the Summer Reading Program. They will got to check out an extra library book to celebrate their success! TheBIGnews is that all of our students were reading over the summer break. We are all winners, when we encourage our children to read. Thank you for supporting our Summer Readers! Use Panther House to watch your kids during the tournament! If you are intending on going to this September 18th event, justemail Mrs. Kenneylkenney@csdo.orgyour plans to attend. We are open until 6pm. We are excited about our Fall After School Classes which begin on September 25. You can find brief descriptions of the class on each of the links below. Just download the flyer, fill out the class registration on the bottom, and turn it into the office with your payment. You can also find flyers in Panther House. Panther House relies on the generosity for our after school snack. We have several spot available for snack donation. Please help us out. Here is thesign-up link.Here are thesnack guidelines. Sign up forsnack donation- there are still several days open. Take a night off to create some memories with your special little guy.This year's mother-son party is all about the FUN!There will be games, food & drinks, activities, line dancing and entertainment.What better way to spend a Friday evening?